I just finished reading my first complete book on Kindle for PC. 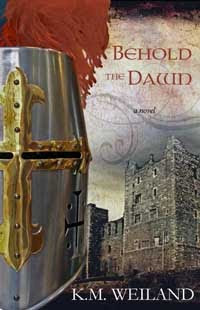 BEHOLD the DAWN by K.M. Weiland. Then I noticed--or maybe she'd recently added--her book in Kindle format for $2.99. Oh, yeah! I'm not going to give you a plot blurb. You can read that on Amazon or on K.M. 's site. And you can see from the cover it's a medieval tale. Knights, wars, deception, corruption, damsels in distress--the book's got it all. And it's told in K.M. 's amazing style. I once heard a speaker at a writers group say that if writing makes you stop and think, "How beautiful. I wish I could write like that," it's defeating its purpose by pulling you out of the story. K.M. 's writing never pulled me out of the story and yet, at the end I sighed, thinking, "How beautiful. I wish I could write like that." Her descriptive powers are magical and musical. I saw and felt everything, and still savored the words as I read them. A perfect balance. Look's like her second book, A MAN CALLED OUTLAW, is only $2.99 on Kindle, too. Anyone venture to guess my next purchase? I LOVE Kindle for PC! You can get so many free and cheap books, and you don't even have to buy a legit Kindle! Look there are 2 different KM's on this. Thanks for the introduction. This book looks way cool! :0) Right up my alley. Can't wait. Actually THREE KM's, if you count the author of Behold the Dawn and both of you who left comments.